Late Sunday night, following accounts on social media and unconfirmed reports of a tragedy, the Ministry of Interior confirmed that a group of Mexican tourists and their Egyptian guides had been mistakenly targeted by security forces in the Western Desert. The military attack killed 12 and wounded 10—officials have been slow to clarify the nationalities of the victims—and the ministry was quick to claim the tourists were in a “restricted area,” where military operations had been taking place. The tragedy stands out as unique in many respects, but was just the latest incident to result in confusion, opaqueness, and contradictions between different government agencies and witnesses. In August, Egypt passed a new counterterrorism law, the most recent influential piece of legislation passed by President Abdel Fattah Al-Sisi in the absence of a parliament. The scope of the new law is quite broad, detailing the legal procedures through which the state deals with suspected terrorists and measures it can implement to counter security threats. Article 35, however, addresses a different issue—the press. Article 35 forbids the press from contradicting the government’s accounts of terrorist attacks. The preliminary version of this law imposed jail time for such a violation, but the penalty was reduced to a fine after domestic and international backlash. The article leaves many questions to be answered, especially as transparency is not a government priority, state institutions cannot be counted on to provide reliable and timely information, and different ministries occasionally provide contradicting information. It also does not address how Egypt’s expansive state media apparatus, which often uses anonymous sources to disseminate information well before official communications, should be regarded by the foreign press or journalists working for private media inside Egypt. Breaking news in Egypt, especially when dealing with terrorist attacks, is characterized by hazy information and contradicting reports. In light of ongoing restrictions and by instituting the new regulations, the government has assumed the responsibility of providing journalists with quick and reliable information. Is it up to the task? While some outlets were independently reporting Sunday’s attack earlier in the evening, state-owned Al-Ahram reported at 1:30 a.m. Monday that 12 Egyptians and Mexicans had been killed, citing a source in the interior ministry. The article said that they had been mistakenly attacked by joint forces in the Western Desert, and that the tourist convoy had been in a restricted area. At around the same time, the interior ministry released a statement saying the same thing. At 4:15 a.m. Cairo time, Mexican foreign minister Claudia Ruiz Massieu said her ministry was attending to the Mexican nationals who were attacked, saying there were two confirmed dead and were seeking to identify the victims. She also immediately demanded an investigation. At noon on Monday, Foreign Minister Sameh Shoukry released his first statement in which he expressed his condolences and said he had told his Mexican counterpart that the tourists had been in a restricted area. Thus far, the government seemed to be unified in the position that the tourists were somewhere they shouldn’t have been, However, since Sunday’s airstrike on the tourist group, the Tour Guide Union—a government-sponsored body—released a copy of the permit for the group, and officials said they had not been in a restricted area. A tourism ministry official told Mada Masr that the convoy had all the proper permits and was not in a banned zone when it was attacked. In comments to the New York Times, armed forces spokesman Brigadier General Mohamed Samir said the military was not responsible for the attack, even if it was involved in it, saying the Ministry of Interior was responsible for issues relating to tourists. The lack of clarity and the contradictions between independent testimonies and the government’s account of the incident put the media in a precarious position, between reporting on what the government says as fact and taking other claims into account. By Tuesday evening, Sisi had expressed condolences to Mexican President Enrique Peña Nieto. Shoukry penned a letter “to the people of Mexico.” After attempting to draw parallels between militant attacks on Egyptian civilians and drug violence in Mexico, Shoukry cast doubt on the initial statements issued by the interior ministry. “There have been reports, many of them conflicting, regarding whether the tourist convoy had the necessary permits, regarding whether it had taken a detour to a restricted area and whether the use of 4 wheel drives [sic] instead of a tourist bus had increased the risk of mistaken identification,” said the foreign minister in his letter, using “reports” to suggest that the initial government testimonies, and those provided to the Mexican government, of the mishap might have been false. This creates further complications for the press who two days after the attack were seeing some government officials contradict initial statements, while others began backtracking. The Wednesday after the attack, the prosecutor-general’s office announced a gag order on all reporting on the incident, literally hours after Shoukry promised a transparent investigation in a statement after with the Mexican foreign minister. While the events of last Sunday were unusual in several respects, the state response was not. The government and local media have published rumors and suppressed information in several other incidents this summer. An explosion on August 20 further illustrates the utter unreliability of state media and the challenges faced by the independent press. At roughly 1:50 a.m. , a loud noise shook windows across some Cairo neighborhoods. In what has become a routine for many Cairo residents, those who were awake began scanning the local media, looking for the source and location of the boom. The private and hardly reliable Youm7 was likely the first outlet to publish an article about the explosion at 1:55, oddly singling out the Giza neighborhood of Dokki saying a “huge explosion” had been heard there. However, it shortly became clear that there had been no detonation in the middle-class Giza neighborhood and the photo used by Youm7 was actually from Beirut. 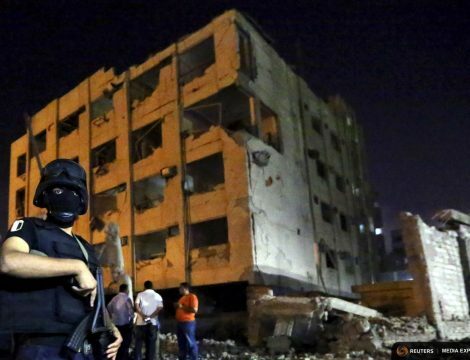 By 2:20 a.m., Al-Ahram became the first government media outlet to report the explosion, only saying it had been heard in Imbaba, a neighborhood a half-dozen kilometers north of Dokki, but nine minutes later cited a security source saying that no explosion had occurred in Giza. At 2:33, Reuters became one of the first foreign outlets to report the sound of a blast but said nothing more than that it had been heard, without naming any specific Cairo boroughs. By 2:40 state television reported that there had been an explosion near the Homeland Security building in Shubra al-Kheima, a Cairo neighborhood across the Nile. At this point, Al-Ahram’s “no explosion in Giza” report was its most recent filing, so while one state media wing was reporting an explosion in a specific area, the other had only just denied that one had occurred someplace else. Finally, photos began surfacing on both state and private media and the location of the explosion was confirmed. The Ministry of Interior then filed an official statement at 3:36 a.m. It took almost two hours for official communication from the government regarding an explosion in Cairo, after frantic speculation from private media and slow—and at times contradictory—accounts from state media. The assassination of Prosecutor-General Hisham Barakat earlier this summer also demonstrates the speculation that festers as the government slowly rolls out official details. On the morning of June 29, a huge explosion rocked the Cairo neighborhood of Heliopolis. The bombing, reminiscent of the assassination attempt of the Minister of Interior two years ago, targeted Barakat’s convoy. At 10:33 a.m., Al-Ahram reported that he had been injured in the blast. About twenty minutes later the same paper said that Barakat had been admitted to the hospital and had suffered a broken nose and dislocated shoulder, a sign that the official’s condition was neither critical nor fatal. Hours later the Ministry of Interior issued its first statement in relation to the explosion, saying the interior minister had visited the blast site. By three o’clock, Al-Ahram was citing sources reporting that the prosecutor-general had died. About an hour later, the Ministry of Interior expressed its condolences. Foreign press was subject to ire two days later when militants carried out a series of attacks in Sinai on the morning of July 1. Sky News Arabia was one of the first outlets to report that soldiers had been killed and wounded in the attack. Al-Ahram also reported that attacks had taken place, without detailing a death toll. Roughly an hour later, the Associated Press cited an “Egyptian official” saying at least 30 soldiers had been killed in the attack. Minutes later Sky News put the death toll at 60, and Al-Ahram had reported a death toll of 11. By now the Armed Forces had issued its first statement, which said 22 militants had been killed, but did not disclose a death toll for soldiers, and did not do so about three hours later when it issued its second statement, when the Armed Forces indicated that soldiers had died, without specifying any further. In fact, the military did not disclose its death toll of 17 until that evening, after the AP raised its death toll to 50 and then 64. July 1 highlighted many problems in which breaking news is handled in Egypt, and how it is further complicated by a lack of on-the-ground reporting in an entire region of the country. In the absence of quick and reliable government statements, the press, including state-owned outlets, resort to anonymous government sources, which at times provide statements that contradict subsequent government communiques. The government’s handling of its domestic media has been more brutish and represents a microcosm of the general inconsistencies of the country’s implementation of rule of law. Earlier this summer, the Committee to Protect Journalists said the imprisonment of journalists in Egypt is at an “all time high”—and all of those detained are Egyptians. Despite claims from the foreign ministry that no one is in jail facing press-related charges, some, like photojournalist Esraa al-Taweel, are being tried for “spreading false news” and belonging to the outlawed Muslim Brotherhood. Photojournalist Shawkan Zeid has been in detention for more than two years, and this week was formally charged with murder, attempted murder, assaulting security forces, and possession of a weapon. Charges like “spreading false news” are applied very selectively and curiously do not seem to affect members of the press whose coverage leans in favor of the president and his government, and the country’s expansive state media sector seems to be largely exempt from the overbearing standards that have found others in jail. 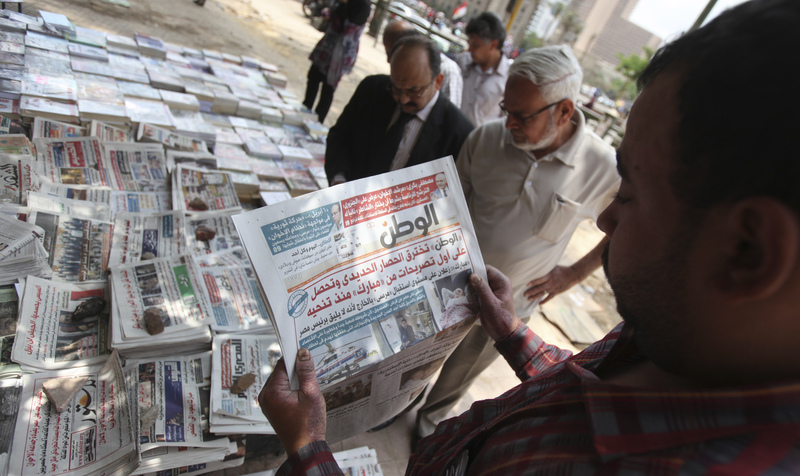 The foreign press and Egyptian media both face their own challenges. While Al Jazeera English journalists have just been handed three year prison sentences, this has stood as an exception, rather than the rule, for foreign press, which faces harassment and public government-sponsored condemnation. Egyptian and foreign press have a duty to uphold ethics and standards in their field and accurately inform the public of news developments. But the government also has a duty—to create an environment in which that is possible, through transparency and an atmosphere devoid of fear of politically motivated repercussions. Media reform is desperately needed in Egypt, but monitoring, restricting, and punishing journalists is not at the core of honest and thorough reform. A government that disseminates information in a trustworthy and timely fashion goes much further.